Neurosis: Oakland Record Release Show For 'Honor Found In Decay' - Tickets On Sale Today! Oakland Record Release Show For 'Honor Found In Decay' - Tickets On Sale Today! As the anticipated tenth album from NEUROSIS nears release at the end of October, today the band have confirmed a record release show for Honor Found In Decay. 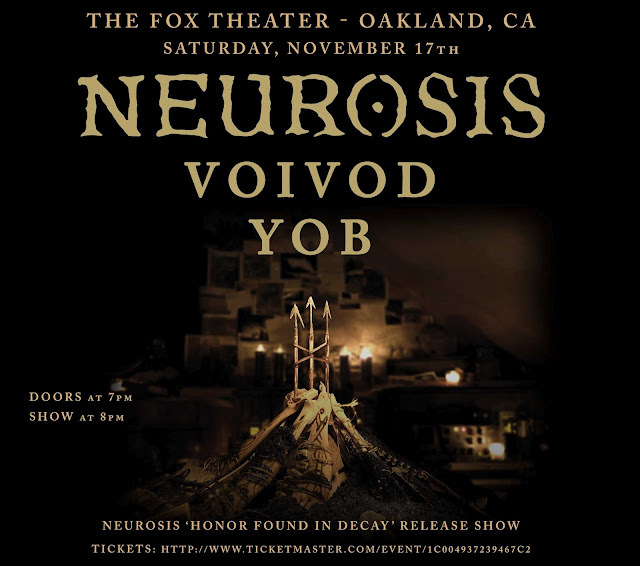 This sole all-ages release show will take place on November 17th at the Fox Theater in the band’s point of origin, Oakland, California, and will also feature opening support from doom wizards YOB and direct support from progressive thrash legends Voivod! Presale tickets for this momentous event will go on sale today at 10am PST AT THIS LOCATION, and the general ticket link will go live this Sunday HERE. Last week the second track from Honor Found In Decay, “At The Well,” was made public worldwide via National Public Radio. The track premiere preceded by a detailed visual trailer for the album created by NEUROSIS’ own visual artist Josh Graham and edited by video architect Kenneth Thomas via Neurot Recordings’ YouTube page. Set to see release through the NEUROSIS’ own Neurot Recordings, the CD and deluxe download versions of Honor Found In Decay will be unleashed in Germany October 26th, throughout the rest of Europe October 29th, and in North America on October 30th, with their previous label home Relapse Records handling the vinyl edition. Preorders will begin on October 15th via Neurot’s webstore HERE.